The 2014 FIFA World Cup gives Buffalo Wild Wings an interesting opportunity to draw in incremental traffic during a time of year when there are not many major events in professional US sports. Buffalo Wild Wings (NASDAQ:BWLD) is a leading operator and franchiser of sports bars in the United States. The company operates 443 restaurants while franchising another 566 locations. With the hype surrounding the commencement of the 2014 FIFA World Cup on June 12, many investors are looking for ways to profit from the matches. Once the Stanley Cup and NBA Finals are finished in mid-June, there is usually a lull in sporting events in the US. As the World Cup is being held in Brazil, the fact that games are being held in similar time zones to the United States is incredibly beneficial as Buffalo Wild Wings and other bars and restaurants will be able to capitalize on the convenient timing of the matches. The World Cup has the potential to boost the financial results for Buffalo Wild Wings in both the second and third quarters of this year given the fact that it will provide a significant amount of incremental traffic that should be accretive to earnings while also adding new long term customers. 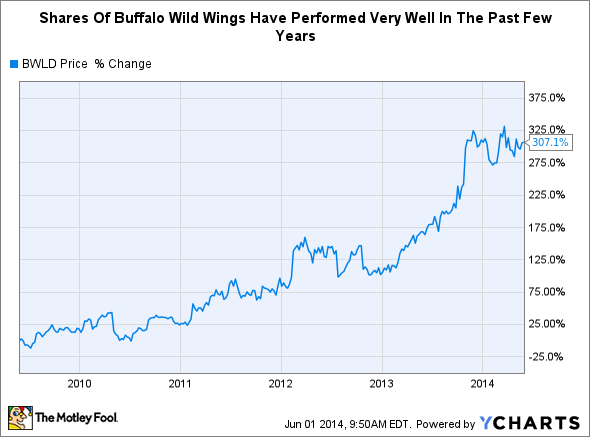 Over the last few quarters, Buffalo Wild Wings has been able to show strong earnings growth. From the first quarter of 2013 to the first quarter of 2014, diluted EPS grew by over 71% from $0.87 to $1.49. The company also produced strong cash flow results with cash from operations increasing by just under 73% in the same period. While also producing strong top line growth, the company was actually able to increase net margins from 5.8% in the first quarter of 2013 to 8.2% in the first quarter of 2014. This strong financial momentum that Buffalo Wild Wings has been able to achieve is a testament to management's focus on growing the company's restaurant base in order to provide a vehicle for future financial growth. However, as shares of Buffalo Wild Wings have performed very well in recent years, the company trading for a rather expensive P/E Multiple of 24.7x 2015 earnings estimates. It is important to consider the relative valuation of the company's shares in relation to their expected growth rates in the future. Peers in the restaurant sector such as DineEquity (NYSE:DIN), Chipotle (NYSE:CMG) and McDonald's (NYSE:MCD), trade for 15.4x, 34.4x, 16.3x 2015 earnings estimates, respectively. While Buffalo Wild Wings' traditional competitors are local sports bars, the company also competes for business with companies from both the fast food and fast casual segments of the restaurant industry. DineEquity owns the Applebee's and IHOP businesses and has been successful in growing them. However, DineEquity's Applebee's brand does not overlap tremendously with Buffalo Wild Wings' target audience as the latter focuses on a younger demographic and operates in a slightly more causal manner than the former. Chipotle and McDonald's in the fast food segment operate at a lower end of the market and while they are in not direct competition with Buffalo Wild Wings' segment, there is some overlap of customers where some trade up to a more service orientated dining experience at Buffalo Wild Wings. Buffalo Wild Wings has carved out a comfortable niche in the fast casual/sports bar segment of the restaurant and its main competition comes from the highly fragmented traditional sports bar market. The company is effectively building its brand and taking market share in many key dining markets. While Buffalo Wild Wings can obviously grow from driving operational efficiencies in their current restaurant base, real and sustainable growth will come from their new restaurant openings. In their February 2014 investor presentation, the company noted that since 2008, they have been able to growth their restaurant base at a compounded annual growth rate or CAGR of 12% for the five years through 2013, while at the same time growing net earnings at a CAGR of 24%. These are impressive numbers from the company and speak volumes to the efforts of management to grow the company's business, which in turn creates value for shareholders. Also in the presentation, the company added that part of their growth strategy is "continuing development to 1,700 locations in the U.S. and Canada" and "sustaining net earnings growth by strong restaurant performance and infrastructure leveraging." Going forward, I would look to management's plans to grow the store base while also keeping an eye on earnings and same store sales trends for the company. The 2014 FIFA World Cup has the potential to add a significant amount of incremental traffic for Buffalo Wild Wings while also giving the opportunity for the company to acquire new long term customers who would not otherwise dine at their restaurants. There will be 64 individual matches over the course of the World Cup with some days having four separate games scheduled. While traditionally known as a hub for watching American Football, Buffalo Wild Wings has the potential to branch out and draw in new customers and add additional traffic as a result of the 2014 FIFA World Cup in Brazil, which should support company earnings momentum.